Neal Scryer has been described as the most influential mentalist since Annemann. Both Richard Webster and Neal Scryer were the first recipients of the "Annemann Award" for their highly sought after books featuring the works of Scryer. Material from these seven books are now in the repertoires of almost every professional mentalist around the world. What makes Neal Scryer's material so popular is that they use regular objects, and many use no props and can be performed completely impromptu. Gerard is a highly sought after television producer, consultant, writer and performer who has worked with some of the biggest names in the business. He continues to perform his live shows internationally, as well as on television. On the first DVD, Gerard takes Scryer's routines and gives them his personal touch creating two of the most powerful presentations you will ever see of two classic routines. Based on the Scryer presentations, Ashes on the Hand and Out Of This World become performance pieces that will change the way your audiences view you as a performer. By using Gerard's 'Process' system you will learn how to take any effect and turn it into a memorable event for your audiences and elevate them to an extremely high level of emotions. Also featured is a bonus interview between Paul Romhany and Andrew Gerard on the works of Neal Scryer. In the second DVD Paul Romhany performs three of his favorite Scryer routines for a live audience, and explains in detail the methods and why he has added these routines to his professional show. Paul Romhany looks at the Scryer routines from a magician's perspective as his performances combine both magic and mentalism. The bonus section also includes two more effects from the books including "Last One Standing" where Paul performs in a 1500 seat theatre. He then explains how he uses the effect for close-up performances, as well as connecting with clients over the telephone. A Scryer routine that is impromptu and very versatile. Richard Webster is the most prolific author for mentalists and cold-readers in the world. He is considered the Godfather on this subject, and for the very first time on DVD he shares his system for Psychometry A-Z. He also shares one of his favorite effects from the Scryer books, "The Haunted Pen." This is something you can carry with you at all times. Over two hours of performances, interviews, and information from three artists with different styles and takes on the Scryer material. BONUS sections include the Gerard Interview,Gerard performing Scryer's Easy Hellstromism, Richard Webster's Psychometry A-Z plus other surprises. "I have not seen the Scryer DVD's yet, but I will. You can bet on it, by that name alone I know it will be killer. Then to slam dunk it they have three of the most creative guys I know presenting the material. Andrew Gerard is in a league all by himself. It is why I have in the past called upon his services as a consultant. I have known him for years and he always gives above and beyond. If that was not enough for one project, you get Paul Romhany. If you have read any of his materials or seen the quality of his free Vanish Magazine. And with the brains behind this venture being Richard Webster, well all I can say is I have known Richard a lifetime and would purchase anything he puts out. You know these DVD's are going to be of the highest quality. Four brains, one incredible product, I will bet my reputation upon it." "It is no secret I have loved every Neal Scryer book published. I have never been let down by the contents of any of these tomes. 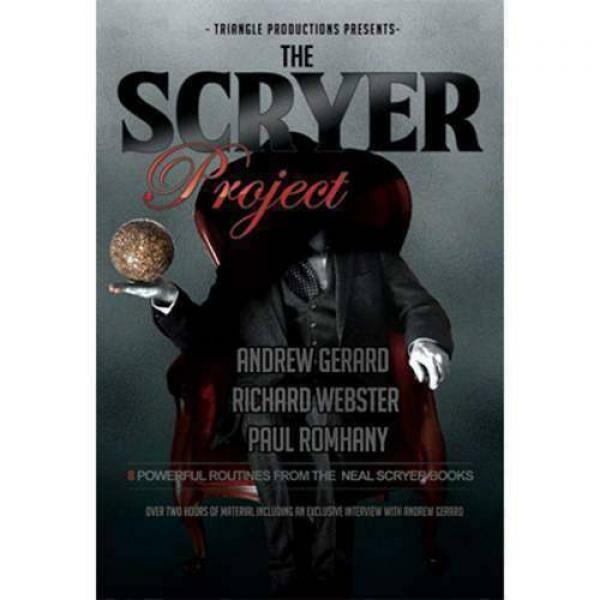 Now we have available a new DVD featuring three top masters, Andrew Gerard, Paul Romhany and the insurmountable Richard Webster performing Scryer material! What more could you ask for? There is no substitute for seeing psychic entertainment performed live. What we have here is the best of the best. The Scryer Project features the finest entertainers doing the most premium material. For those of you who need to see it done to appreciate it, here is your chance! I would have killed for this release when I was first starting out. I would kill for it now! Don't let this one pass you by. Get The Scryer Project and see what real psychic entertainment is all about! "What happens when the material of a brilliant mind like the enigmatic Neal Scryer is performed by such a charismatic performer as Andrew Gerard? And when great minds like Paul Romhany and the legendary Richard Webster are involved in a project like this? Neal's strength is it not only to cut directly to the essence of an effect, more than this, his routines and sequences exhale a breath of kindness, compassion, empathy and enjoyment of life that one can hardly elude. This is what makes Neal's work so special. Even if most of his ideas are technically simple, but their premises touch straight the hearts and souls of his participants or clients. No doubt that this material fits perfect to a sensitive performer like the brilliant Andrew Gerard. And when minds like Paul Romhany and Richard Webster work on this - oh my .... what a gift!